This collection is composed of igneous volcanic and intrusive rocks from the St. Francois Mountains of Missouri. 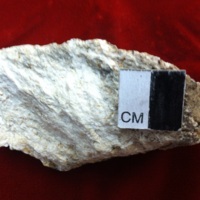 The variation within the collection can be used to explain the geologic history of the area. 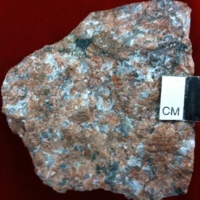 The St. Francois Mountains batholith was formed by granitic intrusions into Precambrian rhyolites, tuffs, and breccias. 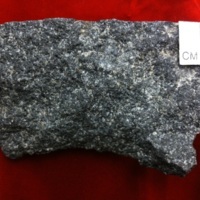 Then basalt, diabase, and porphyritic intrusions cut the granitoids. 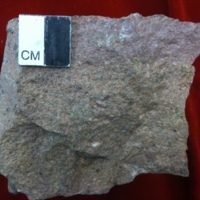 Early study of the geochronology of the Precambrian rocks within the St. Francois mountains. Provides further insight upon the sequence discussed in the dscription. 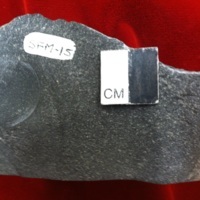 Isotopic analysis of oxygen isotope content within mineral grains within the Precambrian rhyolitic rocks of the SFM yields data that suggests Precambrian oceans were similar to modern day meteoric oceans. OCR PDF of supplemental information for the St. Francois Mountains collection. Hand Sample: Holocystalline, phaneritic, medim-grained granitoid with subhedral grains of smoky quartz, plagioclase feldspar, potassium feldspar, and biotite. Weathering to red-yellow on some surfaces. 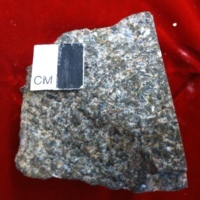 Hand Sample: Holocrystalline, phaneritic, medium-grained granitoid with an abundance of alkali feldspar. 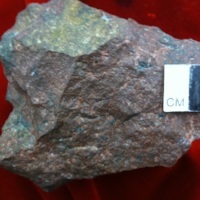 Other minerals include quartz and biotite. Some chemical weathering has produced a white coating. 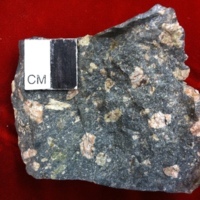 Hand Sample: Holocrystalline fine-to-medium-grained phaneritic rhyolite with quartz, biotite, and plagioclase crystals generally no larger than 2mm. Weathers to brownish-orange. 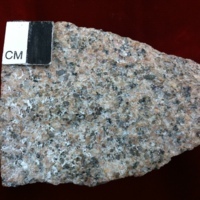 Hand Sample: Holocrystalline, coarse-grained, phaneritic granite with dominant alkali feldspar crystals, as well as quartz and plagioclase feldspar. Veins or pockets of dark brown-black material dispersed intermittently. Hand Sample: Aphanitic brown-black basalt with microcrystalline inclusions of quartz and alkali feldspar. Weathers to yellow orange. 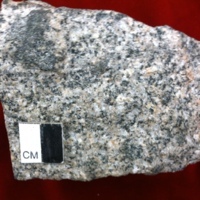 Part of a dike cross cutting granite at the Cornwall Quarry. 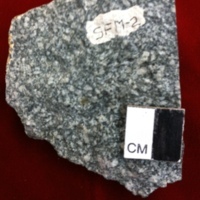 Hand Sample: Hypocrystalline, porphyritic rhyolite. 20% subhedral to anhedral biotite, quartz, and microcline (sanidine) phenocrysts. 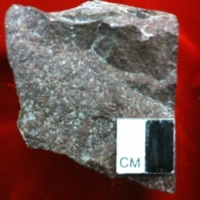 80% grey-brown groundmass. Massive. 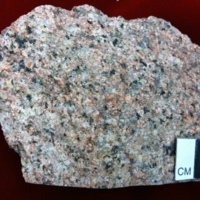 Hand Sample: Porphyritic orange-pink rhyolite. 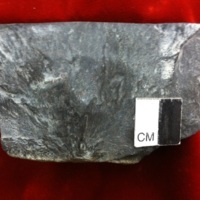 Dominantly potassium feldspar with some black crystals. Weathers to brown-black and yellow-brown. Hand Sample: Porphyritic (or coarse-grained phaneritic) diorite with coarse-grained white plagioclase laths up to 1cm and some black mineral. Weathering to rust-orange color. 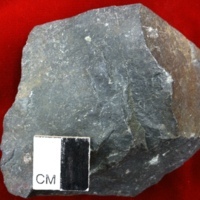 Hand Sample: Aphanitic, pyroclastic grey-black tuff. Conchoidal fracture pattern from a strike-point on one edge. Weathers to yellow-brown. Hand Sample: Aphanitic grey-black color. Weathers to yellow-tan and orange. Small vesicles present. 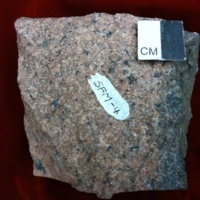 Hand Sample: Phaneritic rhyolite with fine-grained phenocrysts of quarts, feldspar and hornblende in a brownish-red groundmass. Weathers to orange-brown. 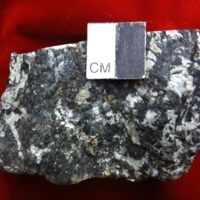 Hand Sample: Phaneritic rhyolite. 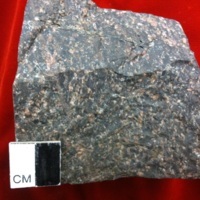 10% fine-grained phenocrysts of sanidine and quartz and 90% dark-brownish-red groundmass. Weathers to brown-orange. 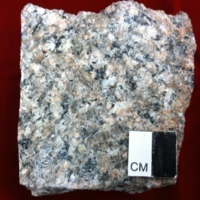 Hand Sample: Aphanitic, grayish-white with some patches of fine-grained grey crystals. Weathers to medium yellow-brown.